Dutch shoe designer Marloes ten Bhömer has created a pair of 3D-printed shoes that can be individually made to fit perfectly. Currently on show at the Design Museum Holon in Israel, the Rapidprototypedshoe is modelled on a computer and produced using a 3D printer that layers two different materials in microscopic structures. Certain parts of the shoe can be removed and replaced when they wear out. The object is on show as part of an exhibition called Mechanical Couture - Fashioning a New Order, which explores the role machines and technology can play in redefining fashion and is on show at the museum until January 2011. Rapidprototypedshoe is built using an additive manufacturing technology in which successive layers of a photopolymer material is UV cured. 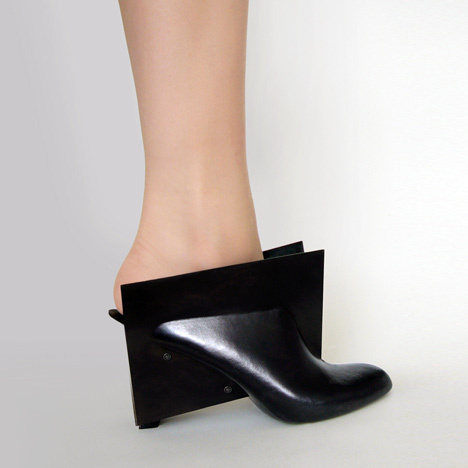 Rapidprototypedshoe is built in one go, but consist of two different materials. The concept of the shoe is based on the idea of the absence of assembly work in Rapid Manufacturing, however the shoe is designed in such a way, that it can be dismantled for the purpose of replacing parts. The different material properties within the shoe are created by constructing/layering the material in microscopic structures from two different materials. A myriad of different material properties can be created using this method.